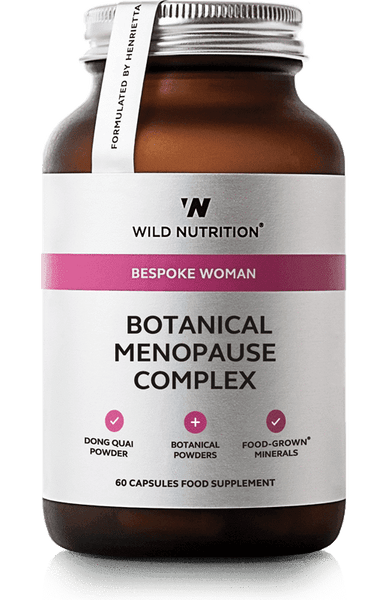 Uniquely formulated for women, a complex of Food-Grown® vitamins and minerals, whole–food nutrients and herbal extracts to support natural beauty from within. 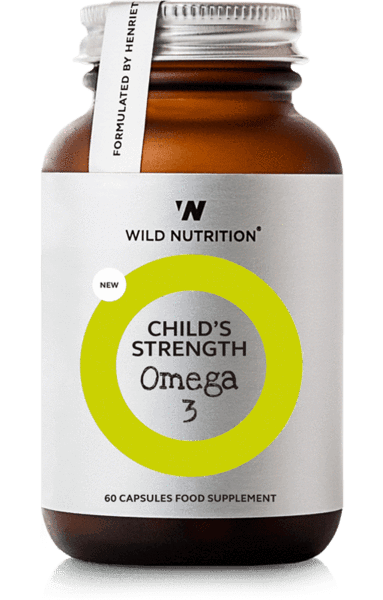 Including zinc for healthy skin and nails, selenium and iodine for hair, copper for normal skin pigmentation and the antioxidants manganese and vitamin E. With sulphur to support connective tissue and botanicals stinging nettle extract and ashwagandha. 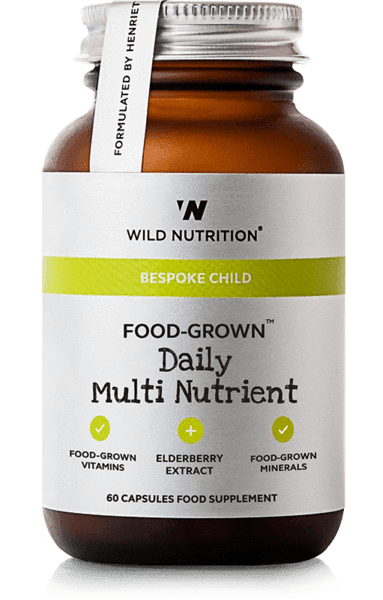 Our Food-Grown® Skin Hair & Nails formula contains herbs and antioxidants to support that inner glow as well as a bespoke blend of Food-Grown® nutrients, whole-foods and herbal extracts. These key ingredients include Zinc and Biotin that contribute to the maintenance of normal skin; Vitamin C to support normal collagen formation; Vitamin E, Copper and Manganese to contribute to the protection of cells from oxidative damage; Selenium and Iodine which contribute to the maintenance of normal hair and nails as well as Copper shown to contribute to normal hair and skin pigmentation. Iodine has the additional effect of supporting the normal function of the thyroid. Imbalances in thyroid function can contribute to hair loss. We all have our own natural and unique beauty and because we firmly believe that beauty comes from within this formulation has been designed to nourish you from the root up. Excipients, wheat, soya, gluten-containing ingredients, artificial colours, added sugars, flavourings & preservatives. All Food-Grown ingredients are produced under low heat conditions, preserving their raw state and naturally provide Bioactive glycoproteins, Bioactive Lipoproteins, Bioactive Enzymes, Chlorophyll, Glucomannan, SOD, Glutathione, Beta-Glucans, Lipoic Acid, Essential Trace Minerals, Glutamic Acid, Polysaccharides, CoQ10 and B Vitamins. Dosage: 2 capsules per day with or without food. 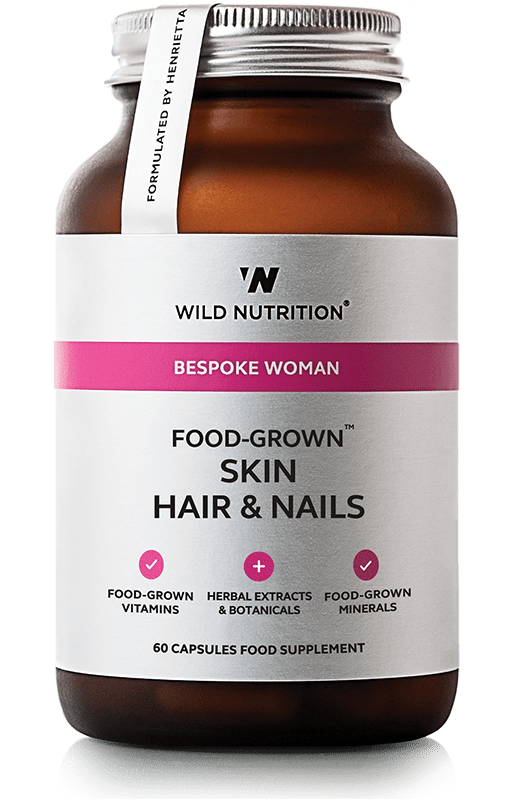 Our Food-Grown® Skin Hair & Nails formula contains herbs and antioxidants to support that inner glow as well as a bespoke blend of Food-Grown® nutrients, whole-foods and herbal extracts. 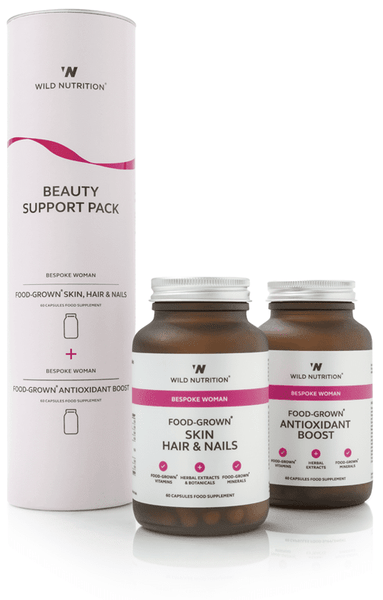 These key ingredients include Zinc and Biotin that contribute to the maintenance of normal skin; Vitamin C to support normal collagen formation; Vitamin E, Copper and Manganese to contribute to the protection of cells from oxidative damage; Selenium and Iodine which contribute to the maintenance of normal hair and nails as well as Copper shown to contribute to normal hair and skin pigmentation. Iodine has the additional effect of supporting the normal function of the thyroid. Imbalances in thyroid function can contribute to hair loss. We all have our own natural and unique beauty and because we firmly believe that beauty comes from within this formulation has been designed to nourish you from the root up. Free from: Excipients, wheat, soya, gluten-containing ingredients, artificial colours, added sugars, flavourings & preservatives.